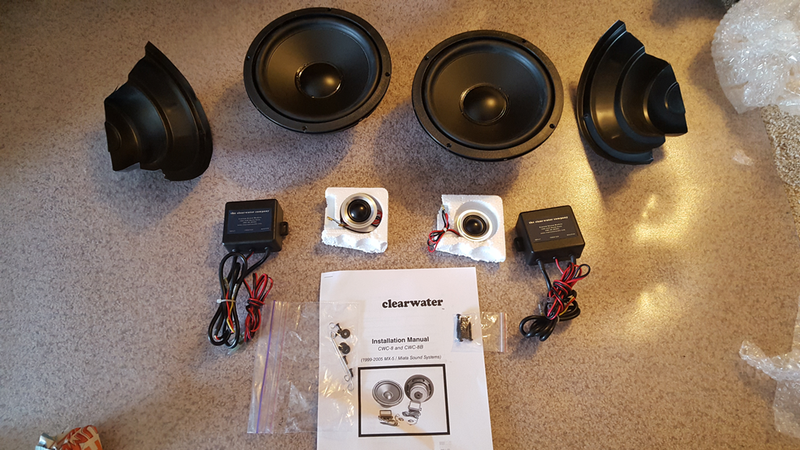 Bought a set of barely-used Clearwater CWC-8B speakers and tweeters for my Miata. This is semi-popular upgrade for NB Miatas, especially those with the optional Bose sound system. Bose (or Blows, according to haters) have unique wires between the head unit, amps, and speakers and most upgrades typically involve gutting the Bose system (referred to as a Bosectomy) to install a higher-end head unit and speakers. I’m wanting to retain a OEM+ look, keeping the stock head unit and it’s ability to be dimmed at night (pops has one in his Ranger and it’s annoying as HECK at night). Here’s a side by side comparison between old, on the left, and new, on the right. The new woofers are about 3.5 pounds HEAVIER than stock and that’s not accounting for the sound control module that’s like 0.25 pounds. Gasp, yes, more weight in a Miata but this is for comfort so it’s worth it. Installing took 3 hours because I’m lazy and I washed my hands numerous times because I got tar all over my fingers from the plastic door seals and I didn’t want to leave fingerprints all over my new sound system. Sound-wise? It doesn’t have the bass of the Bose system but the sound is more crisp and clear overall. I also got rid of the infamous “Bose Buzz” that sometimes affects these speakers as they age. Best of all, I get to retain the speed-sensitive volume function of my factory Bose head unit! That is an amazing function because I can keep my hands on the wheel rather than constantly adjusting the volume as change speed. Retail price: $300 before s/h. I paid $175 through a seller on Miata.net forums for a system that was used for only two months before their head unit bit the dust. He even sold it to me in its original packaging and all the necessary hardware minus the zip-ties. There’re no wires to be cut, no holes to be drilled, and nothing that can’t be easily undone if I decide to switch back to the Bose step up. Clearwater’s promise holds true in terms of being an easy-to-install kit. The hardest part was just working in the garage with bugs, humidity, and heat. I HIGHLY recommend you have a lot of spare zip-ties if you’re indecisive like me as you’ll be cutting and re-zipping ties until you’re happy with your wire management. I got these at about 40% off, which is worth it for a high-quality woofer and tweeter setup that doesn’t require you to cut and splice wires or change out your head unit. I don’t have to disconnect the amps behind the dashboard or redo the wiring, which is worth it for someone like me who doesn’t have the time or skills for something like that. Would I do it again? Yes, but only because I can’t buy new factory replacements to maintain my OEM+ theme.